Though I have already written a couple of posts about traveling to the Andaman and Nicobar islands located in the Bay of Bengal, I think I left out some more outdoor activities in other islands in the archipelago apart from the main South Andaman Island where the capital city Port Blair is located. 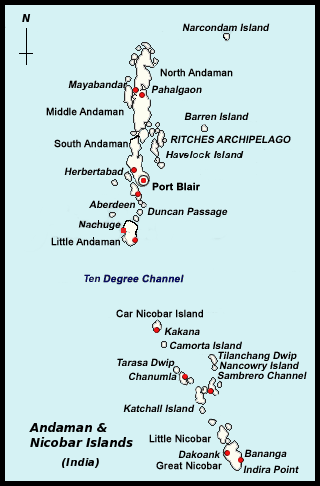 The Andaman archipelago comprises 572 islands and islets out of which only 35 islands are inhabited. 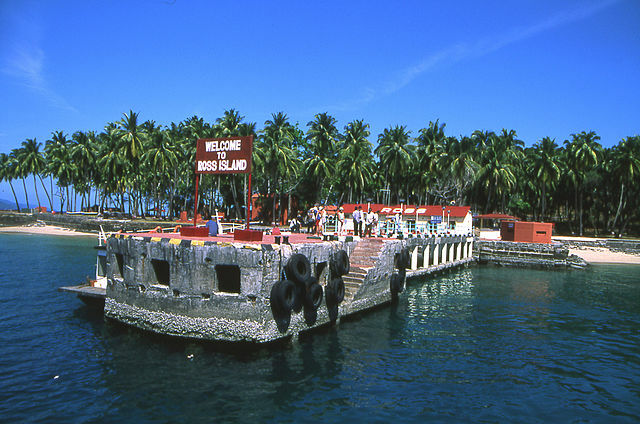 Every single island is worth traveling to and Port Blair is the gateway for visiting other small islands and islets. All the inhabited islands are very tourist friendly which means there is a wide range of fun activities to do without getting bored. Let us look at all those fun things to do in the Andaman and Nicobar Islands archipelago that belongs to India. Here is an overall map of the Andaman Islands. When is the good time to visit the Andaman islands? Andaman and Nicobar Islands have no such as off-season. If you love to watch the rain pounding the sea, especially from the open beach, then, anytime in the year is a good time to travel to the Andaman Islands and Islets. In addition, traveling to the Andaman Islands won’t deplete your bank balance. Port Blair being the capital of Andaman islands, you will naturally land in the South Andaman Island. Tourists, bothered by the tropical heat and humidity, would immediately want to hit the coast. For them, there would be several ferries waiting at the dock. You can either take a short ride on the Bay of Bengal or begin your island hopping from the day one. What you saw above is a ferry taking the tourists for a ride. Oh, I was just pulling your legs; the ferry ride was from Port Blair to Havelock Island, one of the attractive islands in the Andaman archipelago. Have you ever rode on a ferry? The feeling would be a bit intimidating as the shore disappears from the sight and you are surrounded by water on all sides. In spite of the eerie feeling, you will start enjoying the bumpy ride quickly. Before you wonder whether snorkeling requires great swimming skill, the video below will appease your fears. As you saw, snorkeling is all about floating on the water without any oxygen mask and webs. Your body will be visible to others all the time. Only your face will be immersed and your breathing is made simply with a small breather. Your eyes and nose will be covered by the snorkeling mask. No swimming skill is required for snorkeling. In the Neil Island, the beach wears white sand and it is so much different from the color of beach sand that you see mostly on other beaches. Neil Island is one of the less crowded islands in the Andaman and hence rather quiet. For enjoying half an hour of snorkeling in Neil Island, experienced snorkeling guides will take you to the Bharatpur Beach. Other fun activities in this small Andaman island are a ride on a boat with a glass bottom and a thrilling activity called Jet Ski Ride. Red Skin Island is a small island that comes under the Mahatma Gandhi Marine National Park. In spite of the presence of such a prestigious marine park, the Red Skin Island is sparingly populated. However, its neighbor, the Jolly Bouy Island is more popular among the tourists. Look at the boat with a glass bottom. Passengers can look through the glass and watch big and small fish swim by. See the coral reefs that seem to wave at you invitingly. 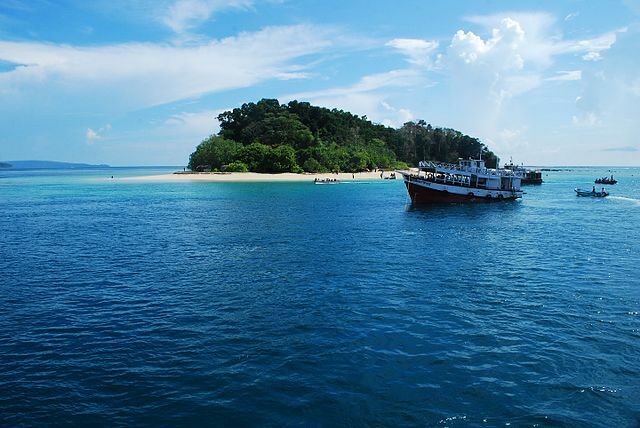 Isn’t this boat ride an enjoyable activity in the Andaman? Warning: The humidity will tire you out. Drink plenty of tender coconut water on the island’s shore. It is the only drink available in the Red Skin Island. 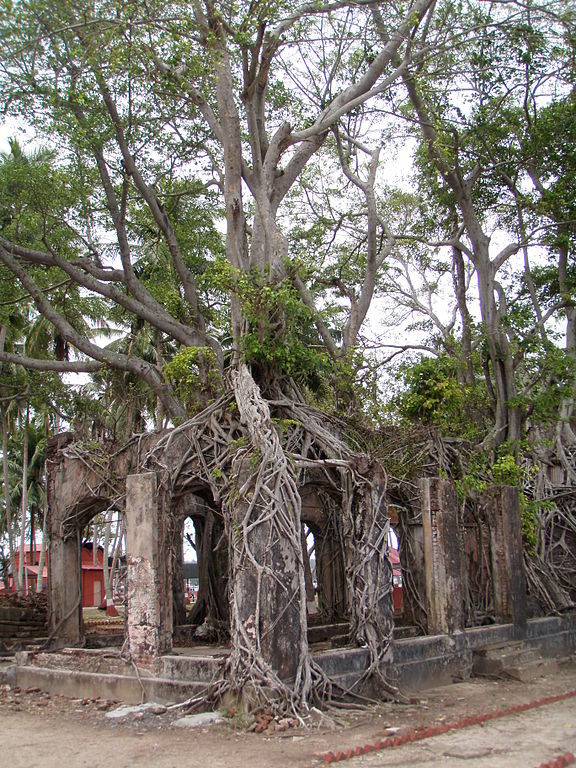 Chidiya Tapu is located about 25 km from Port Blair. It’s a secluded place but safe of course. It’s the dense tropical forest that might scare you a bit. 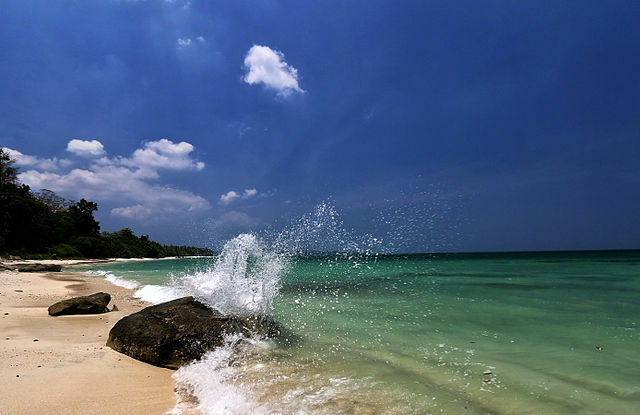 This beach is situated at the southern-most tip of South Island, Andamans. The Chidiya (birds) Tapu is said to be the best viewpoint for watching the fiery orange ball taking a dip in the sea. 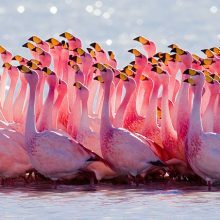 In addition, if you are lucky, you can spot some of the birds of these tropical islands. 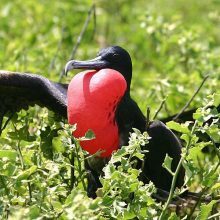 More than 40 species of birds can be spotted here and all of them are endemic! 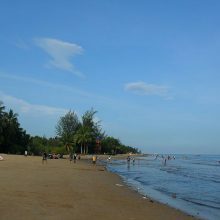 Its neighboring beach Mundapahad is also an ideal spot to watch the sunset. 5. Ross Island and the British reminiscence. The Andaman Islands were once inhabited by the native tribes that include Mongoloid, Nicobarese, Andamanese, Onges, and the Shompens. In fact, some of them still live in North Sentinel Island. They are called by the island’s name, Sentinelese. If they see some tourist boats approaching their island, they will start attaching the visitors with arrows. If you visit the Anthropological Museum in Port Blair, you can pick up several interesting facts about the tribes. 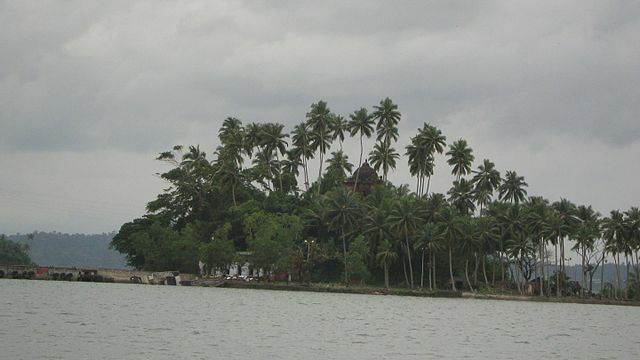 The North Bay island is about 30 km from Port Blair’s Pheonix Bay Jetty. 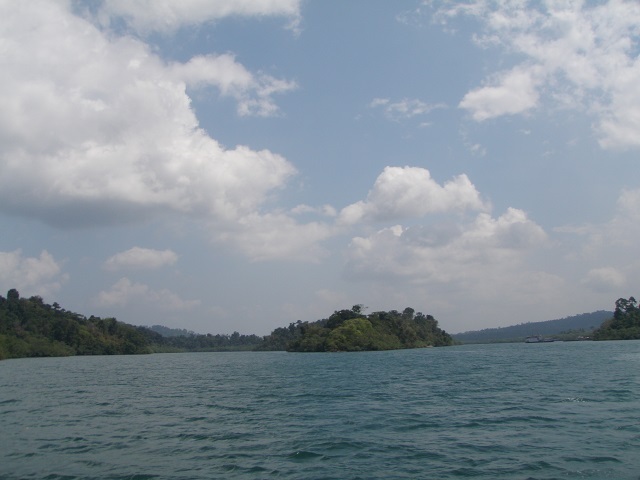 To go and come back to Port Blair, the travel duration is 4 hours. 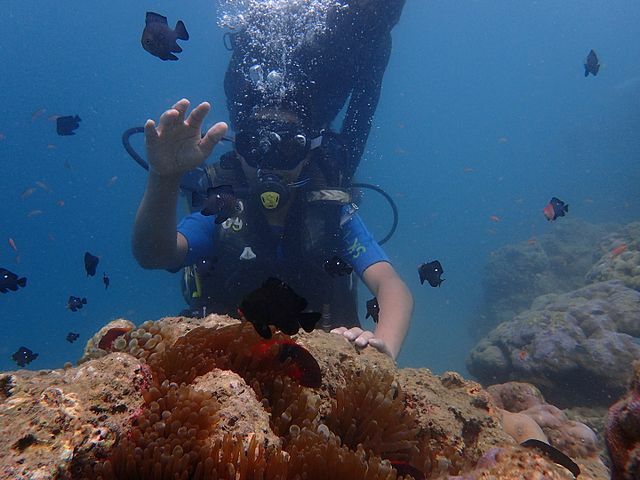 The walking on the sea floor can be the most exciting activity in the Andamans and also very expensive. It costs around Rs.3000 per person. Even scuba diving is charged at the same rate whereas snorkeling, another fun activity will cost just about Rs.300 or so, depending on the crowd. There is a mountain in the North Bay Island called Mount Harriet. If you go to the top of the mountain, the view of the sea will be breathtaking. 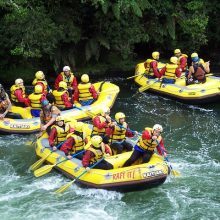 Though I have written about some of the activities in the smaller islands of Andaman, you can enjoy all of them under one roof which is the Rajiv Gandhi Water Sports Complex in Port Blair. Viper Island-the name itself sends a chill up my spine. I am terrified of Viper snakes. In this island of Andaman, there is a building that served as a prison during the British rule of India. The prison is now in near ruins. Visiting the prison may certainly not be a pleasant activity for all, especially for the Indians. If you love to know about marine life, you will enjoy going around this marine park and a museum. 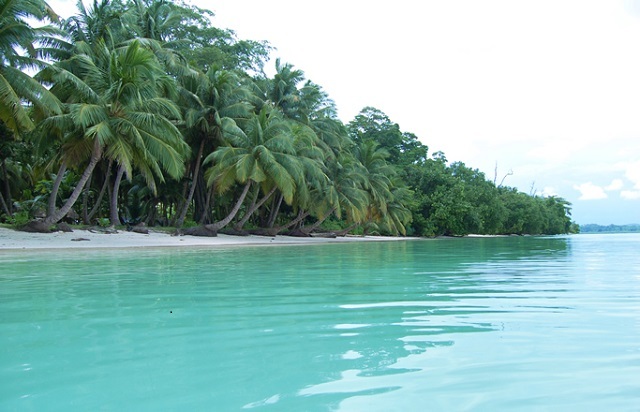 Baratang Island is one of the islands in Andaman archipelago. It is quite far off from Port Blair, about 100 km or so. You can reach this island to see the mud volcano and some lush mangrove forest by road. This island is located between South and Middle Andaman administrative region. From Port Blair, you can take a Government bus to Mayabunder town via Rangat. Then, you will take a ferry to reach Baratang. In Baratang, the most unique natural phenomenon is the mud volcano. It is located near the Jarawa Creek. The underground organic matter has decayed to form natural gases. The upper cover mud is pushed up by the gases. The mud would not actually erupt as a volcano but the mud forms bubbles and oozes out resulting in a crater filled with creamy mud. If you stand the sight of swamps and not afraid of myriad water insects, you can cruise slowly in a small boat on a canal that is surrounded by thick vegetation. If luck favors you, you can spot several lovely looking birds that prey on the insects. It is an uninhabited small islet with abundant tree cover that attracts thousands of parrots. They come only in the evening and leave the next day morning, not to be seen anywhere near. Very mysterious! The parrot island is close to the Baratang dock. It is a town in the Middle Andaman Islands. 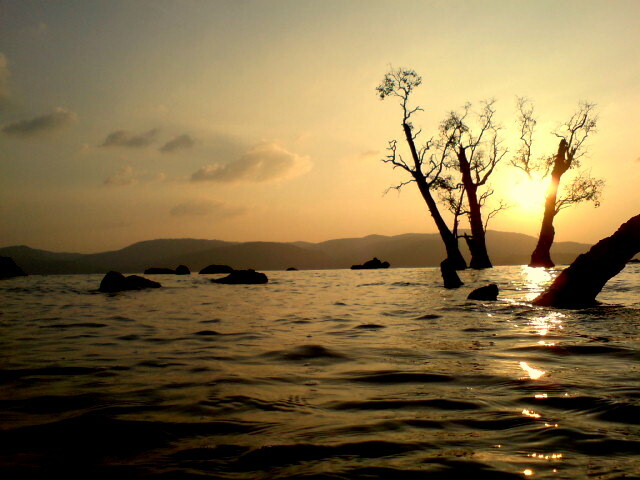 If you love natural beauty, you may spend hours in this small Andaman town full of mangrove forest and quiet beach. Barefoot is a resort in Havelock Island, Andamans. An expensive resort that also offers a holistic natural therapy and ayurvedic massages. The Barefoot resort is set amidst luxurious rainforest with an uninterrupted view of the Bay of Bengal. In this resort, throughout your stay, you will be barefooted. 15. Scaling the Saddle Peak. The Saddle Peak is situated at a height of 2400 feet! Trekking up the mountain to reach the peak must be a memorable experience. In just every Andaman island, you can indulge in Kayaking and snorkeling. As shown in some of the videos above, the water is crystal clear allowing you to see clearly what goes on underneath. At some places, you can even spot the friendly dolphins. In the smaller islands, you can swim to your heart’s content without anyone disturbing you. I think the Andamans have much more to offer to the tourists than even the Maldives. So many interesting activities to do there, did not have idea of all these, loved the post.